With both his 2010 releases (Live from the Royal Albert Hall and Black Rock) still riding high on Billboard’s blues album charts, no one could blame Joe Bonamassa if he had decided to spend the first part of the new year taking a bit of a breather. Especially considering Bonamassa’s many other accomplishments in 2010: in addition to his own releases, there was the fall debut from Black Country Communion, the English-American rock band made up of Bonamassa, Glenn Hughes, Jason Bonham, and Derek Sherinian; an appearance at Eric Clapton’s Crossroads Guitar Festival; and honors from a number of guitar and music industry publications that included Guitar World dubbing him a “Blues Rock Titan,” being named Billboard’s top blues artist, and his selection as both Best Blues Guitarist for the fourth consecutive year and, for the first time, Best Overall Guitarist in Guitar Player‘s annual Readers Choice Awards. Fortunately for us, the blues-rocker has left little room for any such criticism, with 2011 finding Bonamassa stirring up as much dust as ever. This weekend, he’ll wrap up the U.S. leg of a two-month North American tour with a show at Pittsburgh’s Carnegie Music Hall (we’ll give you a run-down of the performance here on the BluesPowR Blog next week). 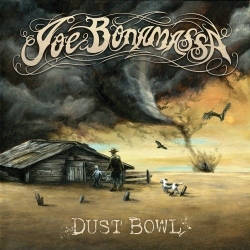 And today brings the release of Bonamassa’s newest album, Dust Bowl, his twelfth full-length solo recording and the ninth on his own J&R Adventures label. Of course, the many successes of 2010 only make for that much more for Bonamassa to live up to in the new year. After debuting at number one on the Billboard charts, Black Rock finished the year as the second best-selling blues album of 2010, and for good reason: give a listen to the soulful blues of Bonamassa’s duet with B.B. King on “Night Life,” forceful takes on such classics as “Three Times a Fool” and “Look Over Yonder Wall,” and the blues-rock of “I Know a Place,” “Wandering Earth,” and the shuffling “When the Fire Hits the Sea,” for example, and you quickly understand just how so many have found this record so appealing – and a mighty tough one to follow in studio. And yet, somehow, the now-veteran performer (though he’s early in his 30s, he’s already been a professional musician for more than two decades) seems to pull it off magnificently with the new Dust Bowl, a project Bonamassa himself has described as the best album he’s ever done. A little bit country, a little bit rock n’ roll, a touch of jazz, and quite a bit more, Dust Bowl – like Black Rock – does an excellent job showcasing the diverse range of Bonamassa’s talents, both vocally and on guitar. The quiet “The Last Matador of Bayonne” features some jazzy guitar and horns, sounding a lot like something you might just as easily hear from Jeff Beck or a mellower sibling to Gary Moore’s “Still Got the Blues.” “The Whale That Swallowed Jonah” is a rocking number, while a driving take on Paul Rodgers’ “Heartbreaker” with Glenn Hughes has all the makings of a current-day rock radio hit, nearly four decades after the song was first recorded by Free. Altogether, it makes for another superb offering from Bonamassa that just may earn him a rare third spot on the blues music charts. This entry was posted in Albums and tagged Glenn Hughes, Joe Bonamassa, John Hiatt, Vince Gill. Bookmark the permalink.